Philadelphia Theatre Company is in a period of transition. As Price assumes the leadership of one of Philadelphia’s flagship theater companies (as of this writing, she is listed on PTC’s website as its executive producing director), her primary task will be to define an artistic vision that Philadelphia Theatre Company can carry forward for years to come. This seemed to be foremost on the company’s mind when it announced that it would not offer any self-produced content during the 2017-2018 season. Rather, the company intends to take a gap year to refocus and rebrand, and will offer a disparate programming agenda likely comprised of existing productions imported from other companies, along with one-night-only events presented in a town-hall format. There are pragmatic reasons for this decision—chief among them is the company’s steep operating costs and existing debt. According to reporting by John Timpane published in the Inquirer, PTC is approximately $1 million in the red, and owes a substantial outstanding loan to TD Bank that could come due as soon as 2020. Much of the company’s current financial instability arose when TD Bank foreclosed on its Broad Street home, the Suzanne Roberts Theatre, in 2014. The company bought the space back the following year. Still, the decision to temporarily hit the reset button might strike some within the local arts community as odd. Theater is thriving in Philadelphia, and there appears to be more of it than ever happening in all over the city. With a subscription base of 55,000, Walnut Street Theatre remains the largest subscriber-supported house in the world, and the Wilma’s Blanka Zizka was recently awarded the prestigious—and lucrative—Vilcek Prize, which comes with an honorarium of $100,000. Smaller theaters are proliferating at a gratifying pace, and Philly Fringe remains an exhilarating event every year, representing a cacophony of diverse and exciting theater-makers. Yet it is perhaps because of this uptick in the local theater scene that Philadelphia Theatre Company most needs to take a step back and rebrand. More than perhaps any other company operating in the region, PTC feels like a theater without a mission or an identity. A quick glance back at recent seasons reveals a largely middlebrow programming agenda, consisting largely of recent plays appearing shortly after a New York run (Ayad Akhtar’s Disgraced, John Patrick Shanley’s Outside Mullingar, Terrence McNally’s Mothers and Sons), a few forgettable musicals (Found, Nerds, Adrift in Macao), and a proliferation of one-person shows either written by or featuring boldface names from out of town (Kathleen Turner, Bill Irwin, Anna Deavere Smith). With the exception of a few plays written by the Philadelphia-based Bruce Graham (The Outgoing Tide, Rizzo), the company has produced almost no new works created by local artists over the past decade. Matteo Scammell and Aubie Merrylees with his alter ego Tyrone in HAND OF GOD. Photo credit: Mark Garvin. This is not to disparage the quality of some of PTC’s productions, which can be quite good. 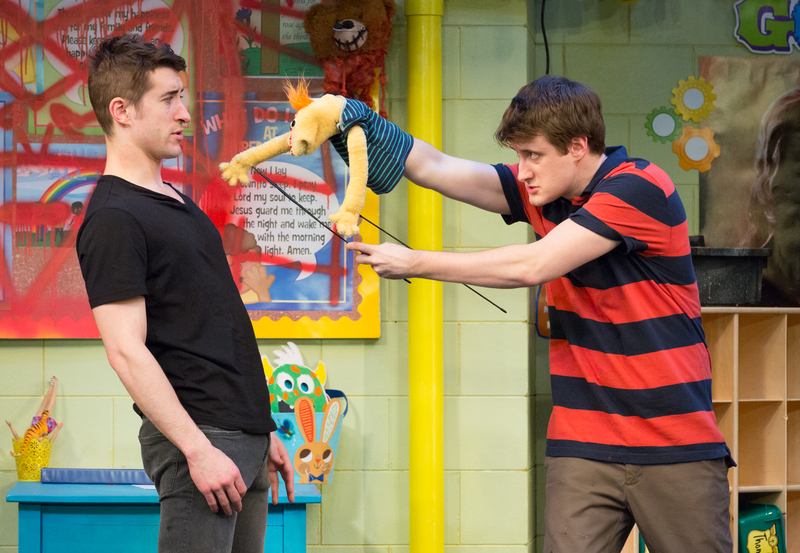 I greatly enjoyed the company’s staging of Robert Askins’s Hand to God, which they mounted a year after the play’s Broadway premiere. But their work doesn’t seem to be reaching a consistent audience. Of the 110 or so seats in the mezzanine of the Suzanne Roberts, about 15 or so were occupied at the performance of Hand to God I attended—and this was a few days after the show opened to genuinely positive reviews. From my perch I could see that the orchestra was maybe half-full. Setting aside that Philadelphia has neither the permanent population nor the tourist trade of a New York or a London, I would have expected a fuller house, especially for what is ostensibly one of the city’s premier producing companies. As Price and the PTC crew set about redefining the company’s mission, they will have to think long and hard about how they can distinguish their theater from its myriad competition throughout the city. Price has said that she’s already reached out to other artists and arts administrators throughout the city—including Zizka and Seth Rozin of InterAct Theatre Company—to take the community’s creative pulse. Since arts writers are rarely included in these kinds of on-the-ground discussions (despite the fact that, by virtue, we regularly see the widest swath of theater throughout the city, and are often keenly aware of what’s lacking), I decided to pick up my pen and offer a few humble suggestions here. Produce local playwrights. James Ijames. Mary Tuomanen. Jacqueline Goldfinger. R. Eric Thomas. All are terrific local playwrights. None of them have ever had a work produced by PTC (although Ijames has worked for the company as an actor). 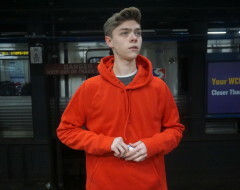 Philadelphia’s close proximity to New York City ensures that some segment of PTC’s audience has already seen Disgraced (produced Off-Broadway in 2012 and on Broadway in 2014 prior to its 2015 PTC production) or Chris Durang’s Vanya and Sonia and Masha and Spike, which arrived mere months after wrapping up a long and successful Broadway run. And frankly, these productions are usually PTC’s least successful. They’re not bad, to be sure, but it’s usually not the kind of theater you want to blow trumpets about. I doubt I am alone in preferring, given the opportunity, to see what local artists are creating presented on Philadelphia stages. Philadelphia Theatre Company could pick up the mantle of Orbiter 3, an artist-run theatrical collective founded in 2014 to highlight works created by the Philadelphia artistic community. Orbiter 3 recently announced that its current season will be its last—the artists to which it gave voice will surely be looking for a home. Bring them to Broad Street. Establish a playwright-in-residence position, or find some cash for commissions. Form a resident acting company. Regional artistic communities thrive when artists have an incentive to stay put, rather than pulling up stakes and trying their luck in New York or Hollywood. One of the best ways to keep local talent on local stages is to see that they are regularly employed. 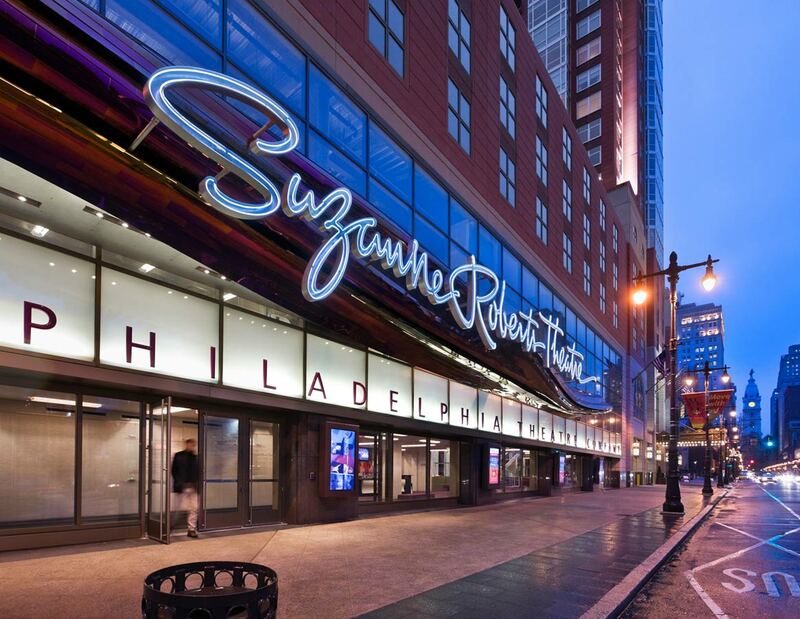 Several of the best theaters in the Philadelphia region have recognized this and formed resident acting companies, from which their productions are regularly populated. 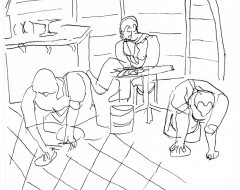 This does not mean that non-company members cease to have opportunities on these stages; it simply recognizes the value of offering a sense of stability in a notoriously rudderless field. People’s Light & Theatre Company in Malvern has maintained a resident troupe since its founding 41 years ago; local luminaries Carla Belver, Melanye Finister, and Peter DeLaurier are among its members. More recently, the Wilma Theater formed the Wilma HotHouse resident acting company with a goal of “hon[ing] a unique theatrical aesthetic for the Wilma through rigorous actor training, which it will then disseminate to the wider Philadelphia community.” Company members include Sarah Gliko, Justin Jain, Campbell O’Hare, and Lindsay Smiling. The formation of a PTC resident company could strengthen the theater’s aesthetic and make it an attractive place for local artists to work. Amplify diversity. Philadelphia has one of the most organically diverse artistic communities in the country, a fact frequently reflected on the city’s stages. 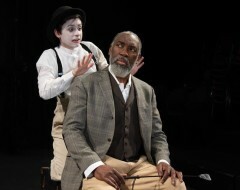 It is not uncommon for Philadelphia theater productions to be cast in a race-neutral manner—this past season alone, it was nice to see actors of color play roles that had largely been taken by whites in prior productions of plays like When the Rain Stops Falling (Wilma Theater), Informed Consent (Lantern Theater Company), and The Nether (InterAct Theater Company). Perhaps that’s why it felt like such a missed opportunity when Hand to God—a play in which the racial make-up of the characters is in no way central to the plot—was cast entirely with white performers. By calling attention to this, I mean in no way to cast dispersion on the fine performances of the assembled company. But in 2017, in a city as diverse as Philadelphia, watching a lily-white cast perform for a similarly lily-white audience feels noticeably retrograde. PTC should do everything in its power to ensure that its productions are representative. Construct a smaller, more malleable space. Garonzik previously floated the idea of building a smaller black-box theater within PTC’s existing complex. The theater would surely benefit from this. Although the Suzanne Roberts might be one of the loveliest auditoriums in the city, it is also one of the most rigidly constructed. The theater’s hard proscenium allows few configurations other than the standard model. It certainly limits the kinds of shows that PTC can produce. One of the plays that Price floated as a possible co-production for PTC’s gap season was Bess Wohl’s Small Mouth Sounds, an inventive and beguiling play that originated at Ars Nova in New York. There is no way that this play—which requires intimacy between the audience and the performers, heightened by an unconventional playing space—could retain its power in a vast auditorium like the Suzanne Roberts. But in a malleable black-box theater, it would be dynamite. Black boxes are also creative incubators. They are great growing grounds for new works, unconventional stagings, reading, and offbeat evenings. They serve as safe spaces for worthy works that might not be ready to play the big room. PTC would surely become a more attractive venue for local writers and directors if it could create a smaller space that would facilitate their works. Venture past the Avenue of the Arts. Price has said she wants to be an “on-the-ground artistic director.” In Philadelphia, the ground extends past Broad Street, beyond Center City. Theater is being created all over town, from South Philly to University City, from Mt. Airy to Northern Liberties. Although Blanka Zizka and Seth Rozin surely have much to teach Price about Philly’s artistic community, engaging with only the most established voices excludes a great deal of valuable voices from the conversation. Price should be talking to Zizka, to Rozin, to Terry Nolen (of the Arden Theatre). But she should also be talking to the folks at Theatre Exile, Orbiter 3, Simpatico, Iron Age, and Azuka. She should be seeing theater in every corner of the city. Philadelphia Theatre Company is an institution badly in need of an identity. Hopefully their year-long semi-hiatus will provide the necessary time for Price and company to decide what they want the next act of this august company to be. The only thing that’s certain is that maintaining the status quo will not work. I’m sure I speak for many Philadelphians when I say I’m rooting for them. LOVE this piece. It would be terrific to have a locally-based new work company in town again.